Pope Francis has revealed that he sought the help of a psychoanalyst for six months when he was 42 and the leader of the Jesuit order in Argentina during the country’s military dictatorship. The pope’s disclosure was made in a book based on 12 in-depth interviews with the French sociologist Dominique Wolton, to be published next week. 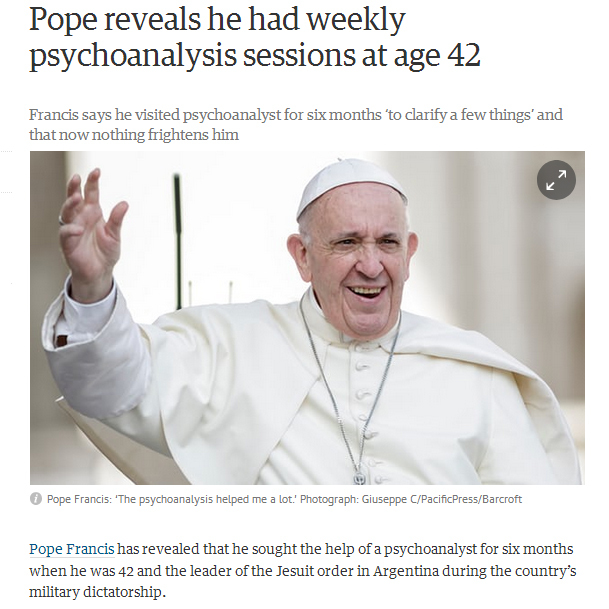 Francis said the weekly sessions with the psychoanalyst helped him a lot. “For six months, I went to her home once a week to clarify a few things. She was a doctor and psychoanalyst. She was always there,” he told Wolton for the 432-page book Pope Francis: Politics and Society. This entry was posted in Freud, mental health, psychoanalysis, psychotherapy, talking treatment and tagged analysis, art & culture, Creativity, Freud, mental health, psychoanalysis, psychotherapy, talking treatment on September 2, 2017 by peterowen.